Michael is the Program Director and the host of Classical Music Indy’s signature program, Classical Music with Michael Toulouse. He has a B.A. in music from Saint John’s University in Collegeville, MN and continues to play piano and study foreign languages for his own pleasure and artistic growth. He first hosted a classical music program in 1987 on WBNI in Fort Wayne, Indiana. 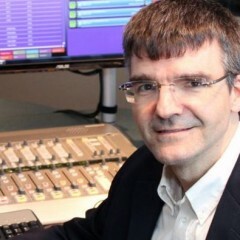 Next, he was a Producer/Host for WUOL, Louisville, Kentucky from 1991 through 1994. In 2002, he became the evening classical music host on Indiana’s largest public radio station, WFYI, Indianapolis. He was appointed Classical Music Indy’s program director and primary host in 2008. He was a 2006 Spectrum Award recipient from the Indiana Broadcasters Association and has taught Introduction to Music courses at the University of Indianapolis. He served as radio broadcast host for the International Violin Competition of Indianapolis’s 2010 and 2014 quadrennial competitions, has emceed American Pianists Association concerts and Indianapolis Symphony Orchestra Marsh Symphony on the Prairie concerts, and frequently hosts the Indianapolis Symphony Orchestra’s “Words on Music” pre-concert discussions.